BARCELONA: Lionel Messi finished with a bloody nose and a swollen cheek but Barcelona left unscathed, with one foot in the semi-finals and Manchester United hoping for another Champions League miracle. Chris Smalling’s clattering challenge in the first half could mean Messi is spared Barca’s visit to Huesca on Saturday, their 11-point lead in La Liga affording Ernesto Valverde the luxury of preserving his captain for next week’s second leg. 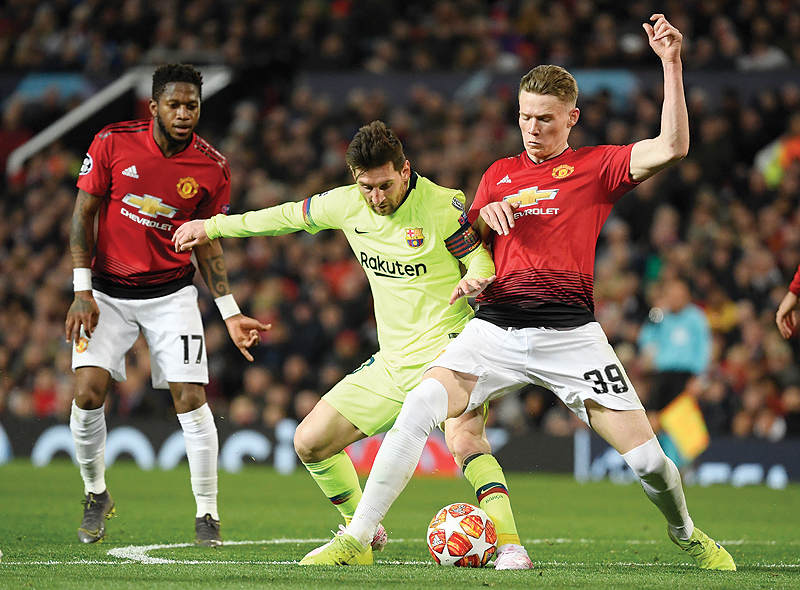 “He was certainly not comfortable, that’s obvious,” Valverde said after his team’s gritty 1-0 win at Old Trafford on Wednesday. A fresher and sharper Messi would hardly make United’s task any easier. Ole Gunnar Solskjaer was keen to invoke memories of their comeback against Paris Saint-Germain in the previous round but it will be an altogether different task winning at Camp Nou, where Barca have lost only once in 52 matches and not in the Champions League since 2013. Their victory was, in part perhaps, due to their opponents’ lack of punch but there was merit too in navigating a sloppy performance with both maturity and resilience. “Neither Messi nor his teammates had their brightest night in Manchester,” wrote Mundo Deportivo. “But Valverde’s 11 played with common sense and tactical rigor.” Since Solskjaer’s arrival, United’s greatest threat has been on the counter-attack while Barcelona have been exposed on the break this season by the likes of Real Betis, Sevilla and Levante. Valverde’s team limited the danger by sitting deep. “They put us under pressure but we controlled it well,” Gerard Pique said. “We were very conscientious,” said Jordi Alba. “Sometimes you go on the attack and leave the defence open but we sat in more and balanced the game.” Pique endured a chaotic start to the season, his form and focus questioned in the autumn when Barcelona’s defence looked leaky. But Pique has got better and better, his performance on his return to Manchester perhaps the peak of what has been an impressive few months since the turn of the year. “We put in an excellent performance defensively, our defense is in the best form of the season,” Pique said. “Gerard has been crucial,” said Sergio Busquets. “Just like always.” Luis Suarez continued his rich vein of form too, delivering again when it mattered most. After his goal sent Barcelona to victory over Atletico Madrid last weekend, it was his header that met Messi’s cross in the 12th minute and proved this game’s decisive moment as well.